The Charcutepalooza challenge this month was hot smoking. If you know me, you know I love to use my smoker, but the weather here in the Pacific Northwest tends to complicate things. 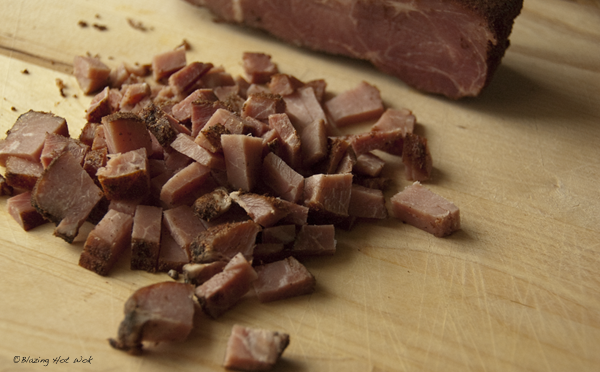 The day I smoked this tasso ham, it was 40º and grey, but by golly, it was mostly dry! It's funny when I think about how much my standards have changed since we first moved to Portland almost 6 years ago. Just the threat of rain was enough to keep me inside. What can I say? I grew up in Las Vegas where it rains maybe twice a year (and is usually accompanied by flash flooding!) Now it has to be raining on an apocalyptic scale to get my attention. I can't even be bothered to use an umbrella anymore. Mind you, I'm not saying I like the rain. I've just made my peace with it. I must be turning into an Oregonian. I went off on a tangent, didn't I? Let's get back on topic. Making this tasso ham was easy. I just followed the recipe in Charcuterie. Here's the gist of it: 4 hours in a dry cure, quick rinse and dredge in a bold spice mix, overnight rest in the refrigerator then into the smoker. The smoking took about 3 hours. Overall, a very easy and relatively short project. Great way to get your feet wet if you're just starting with the homecuring or smoking. The ham itself is delicious. It's equally smoky and spicy, which makes it perfect for flavoring stews and such. Our whole family loved it in scrambled eggs. I've sliced it thin and used it in a fried egg, cheddar and tomato jam sandwich. Awesome. I also combined it with peas and served it with homemade pasta in a cream sauce. 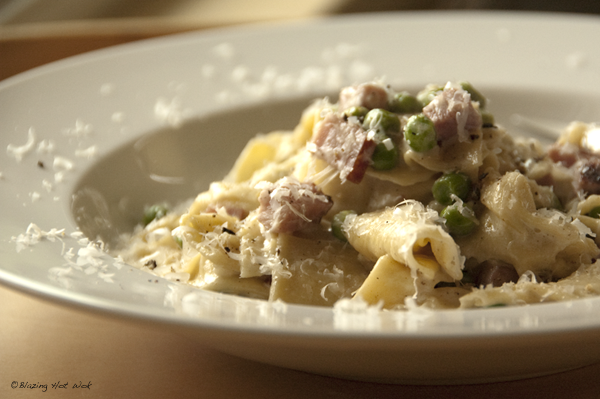 The combination of sweet peas and spicy-smoky ham in a creamy sauce—what can I say? Super awesome. I apologize if you were looking for a real recipe. It's so simple, there's no need for one. Here's the basic idea: In a medium sauce pan over medium heat, sauté 1 finely chopped shallot with a couple cloves minced garlic and about 1 cup (or more) of the ham for 2 to 3 minutes. Add cream (about 1 cup or so should do for 1 package of pasta), bring to just a boil then reduce heat to a simmer. Add about 1/2 to 2/3 cup grated parmesan cheese and stir to melt. A couple minutes before the pasta is done, add peas (fresh or frozen is fine) and salt and pepper to taste. Once the pasta is done, drain and toss in the cream sauce. Serve with additional parmesan sprinkled on top and a few turns of freshly cracked black pepper. How quick and easy is that?